FOXBOROUGH, Mass. -- New England Patriots quarterback Tom Brady has been impressed with his former understudy, Jimmy Garoppolo, who has posted a 4-0 record in his first four starts with the San Francisco 49ers. "He's done a great job. 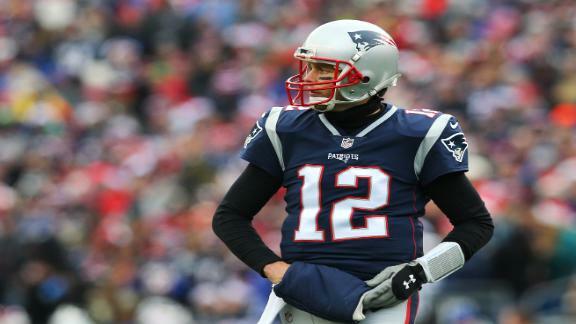 You go in there and get the opportunity to play and win games, that's what we're all here for," Brady said in his weekly interview on sports radio WEEI. "It was good to see, and good for them to beat Jacksonville [on Sunday]. That certainly helped us. I'm really happy for Jimmy. He's worked really hard and it shows up when he goes out there and plays really well." The 49ers' win over the Jaguars helped the Patriots clinch a first-round playoff bye. Brady said he keeps in touch with Garoppolo -- "just words of encouragement and so forth" -- and that the two will "always have a great relationship." Asked how Garoppolo's success reflects on the Patriots, Brady said: "I think it's really a credit to him. You do what you can with the opportunities you get. I think it's great for any player and anyone who has been in the Patriots' system to watch how the coaches prepare the players. There is obviously a high standard and high expectations for us any time you take the field. "Any time you're in a winning environment, that definitely helps, and I think guys really enjoy that. You take what you can and try to use it in other places if that's where you go. Like I said, I think what they're doing is a credit to them. I don't think anyone should take credit for what those guys have accomplished." Brady was then asked a hypothetical question by host John Dennis on whether he ever considered the possibility that he'd have been traded to the 49ers instead of Garoppolo. Brady said he didn't consider those scenarios. "I'm here with the Patriots, and I love playing for this team, and playing for Mr. Kraft and Jonathan and playing for Coach Belichick and all the other coaches and all the great players," he said. "I think I've had it pretty good." Tom Brady speaks on the "Kirk and Callahan Show" and expresses how proud he is of Jimmy Garoppolo's play with the San Francisco 49ers. Jimmy Garoppolo and the 49ers take a W from the NFL's No. 1 defense, continuing San Francisco's run of strong play.